Measuring the magnetic fields of our galaxy poses an interesting challenge. The galactic magnetic field doesn’t emit or absorb light, and of course we can’t directly measure it at various places like we can for Earth’s magnetic field. The galactic magnetic field does, however, interact strongly with things such as ionized gas and electrically charged dust, so we can indirectly measure the field by the way it affects these things.One way that the field has been measured is by looking at the radio bursts of pulsars. When pulsars emit a burst of radio waves, they are polarized. That is, the oscillation of the radio waves has a particular orientation, similar to the way you can shake a jump rope up and down, or side to side. When a radio wave passes through a region of ionized gas, it causes the gas to vibrate slightly. But if there is a magnetic field in the region of the gas, the gas can move easily along the magnetic field, but not in other directions. As a result, the polarization of the radio waves rotates, and by measuring this rotation we can determine the strength of the magnetic field between us and the pulsar. The advantage of this method is that it is relatively easy to do, but the big disadvantage is that we can only measure the magnetic field along the direction of a pulsar. Another way is to look at the light emitted by ionized gas as it moves through the magnetic fields. 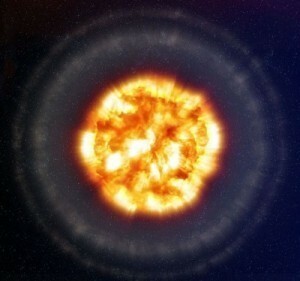 The charged particles of the plasma spiral along the magnetic field causing them emit radio waves through what is known as synchrotron radiation. These are typically in the form of radio waves, and are also polarized. With this method we can determine the magnetic field wherever there is ionized gas (which is pretty much everywhere), but it is a much fainter signal than that of pulsars. This emission of polarized radio waves by ionized gas also poses a challenge for detecting evidence of inflation in the early universe. You might recall an earlier post talking about how such radio loops due to galactic magnetic fields look very similar to the B-mode polarization observed by BICEP2. Discerning the difference between polarization due to cosmic inflation, and polarization due to magnetic fields is very difficult. 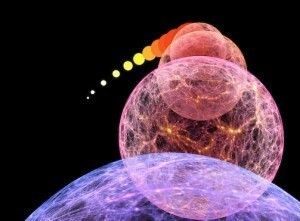 Now new data from the Planck satellite should make that a bit easier. 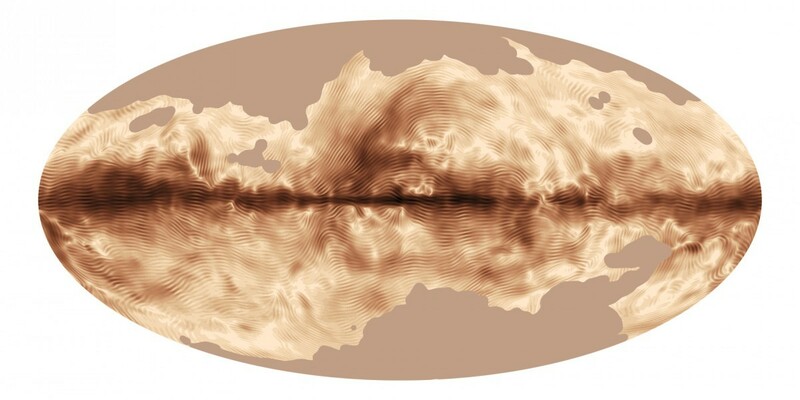 The Planck team has recently released a map of the galactic magnetic field obtained from emitted polarized light. In addition to ionized gas, there is also a significant amount of dust throughout the galaxy. This dust is typically cold and doesn’t emit much light, but does emit a small amount in radio and microwaves. Since most dust particles are not spherical, most of the emitted light is polarized along the length of the grain. 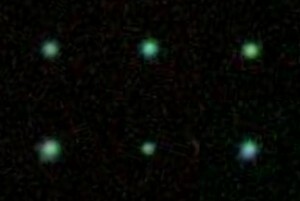 If the grains were simply floating randomly, then all that polarization would wash out and we would just see a faint glow from the dust without any orientation. But in the presents of a magnetic field, the grains will tend to align with the magnetic field. As a result, the light from the dust is polarized along the direction of the magnetic field. By measuring this orientation we can determine the direction of the magnetic field. The stronger the magnetic field, the more strongly the dust will align with the field, so the strength of the polarization also tells us the strength of the magnetic field. Planck can measure the light emitted by these dust grains very precisely, and the result can be seen in the image. It is the most precise map of our galaxy’s magnetic field ever obtained. This is a significant achievement in itself, but this map will also allow astronomers to take into account the effect of radio loops on B-mode polarization. 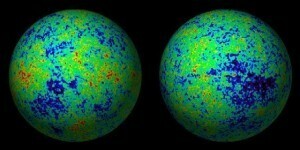 With this map we can better filter out galactic effects when looking at the cosmic microwave background. So later if Planck observes B-mode polarization similar to BICEP2, we can be sure that it really is due to inflation. Good golly, I fail at my native tongue.